“Why isn’t she in tears now?” asked assistant district attorney Stuart Silberg during his statement ahead of the sentencing of Yosleyn Ortega in Part 32 of New York Superior Court on Monday. Ortega had just sat through over 40 minutes of statements from Marina and Kevin Krim, whose children Lucia and Leo she killed on October 25, 2012, and was convicted of murdering in that same courtroom last month. True to form, the Krims’ words in court were courageous to speak and grueling to hear. Also true to form, Ortega seemed unaffected, staring straight ahead or bowing her head with no discernible emotional response. She would eventually cry though. After the Krims and Silberg argued that she should be imprisoned for life, after Ortega’s eccentric attorney Valerie Van Leer-Greenberg pleaded that the judge to show her client “the mercy of our law,” literally begging that Carro “weigh and consider her [mental] sickness,” Ortega spoke up to plead for mercy herself. It was the first time she had spoken for longer than a brief interjection or louder than a stage whisper in that courtroom—the only time the jury heard directly from her during her trial was via footage of an interview with psychiatrist and expert witness of the prosecution, Dr. Ali Khadivi, filmed in 2016. Although many people wish me all the worst, my life is in the hands of God. I am in jail, but perhaps there are many more that are more imprisoned than I am. I ask for a great deal of forgiveness: to God, to Marina, to Kevin. I wish my family...I told my family that I did not feel well. At one time when I was walking, I had Lulu, I told Lulu, “Lulu I don’t feel good,” and she would say, “What’s wrong? I have to go to the bathroom.” I went to the doctor. He gave me another appointment. He said, “If you don’t come they’re going to charge you $10.” I told Marina. I didn’t tell her it was for the doctor but I told her I had an appointment, but she had another appointment and I was not able to go. I really feel it deep in my soul. And to the D.A., may God bless you for everything he wishes me and everything he has done, but God is up there. As she spoke, her voice quivered and she began to weep. So egocentric were her words that she certainly didn’t at all seem to be interested in disproving the Krims’ repeated accusations of narcissism. Van Leer-Greenberg had revealed during her statement that at Rikers, Ortega had refused to take the variety of drugs she’s been prescribed of the antipsychotic, antidepressant, and anti-anxiety varieties. Moments after Ortega’s rambling and sporadically coherent statement, Judge Carro handed Orega the maximum possible sentences: 25 to life for each of the charges of murder in the second (to be served consecutively), and life with no possibility for parole for the charges of murder in the first. Ortega is 55 and will die in prison. “The evil defendant,” is how Marina Krim referred to Ortega during her 13-minute statement. Before taking the podium, the mother of the murdered children hesitated and heaved several deep breaths. Once there, she admitted she hadn’t planned to return to that courtroom after her emotional testimony at the start of the trial. Marina spoke of her surviving daughter Nessie’s resilience and how the spirts of Lulu and Leo live on in the children that Marina and Kevin have had since the murders, Felix and Linus. Marina blamed the deaths of her children not just on Ortega, but on “a conspiracy of an entire family of bad, evil people,” who had lied about Ortega’s nannying experience (Ortega’s family friend Yaquelin Severino sent a false letter of reference, for example). Marina said that not a single member of Ortega’s family reached out to hers to express their condolences, not even Oretega’s son, Jesus Frias, whom the Krims used to pay to walk their dog. Frias notoriously referred to the murders as an “accident” during his testimony. She also highlighted the Lulu & Leo Fund, which according to its mission statement, “helps children and families foster creative confidence and build resilience through programs that provide meaningful engagement with the principles of creativity.” Much of the statement of her husband, who took the podium directly after her for 28 minutes, highlighted this work as well. And yes, I am trying to break your heart. After Silberg delivered a compact recap of his closing statement, Van Leer-Greenberg was called on for her statement. The Krims and some of their companions pointedly, loudly got up from their gallery bench and exited the courtroom. And then Judge Carro condemned Ortega to a life in prison and she left the courtroom in handcuffs that were attached to a belt she wore. Outside the courtroom, I talked to David Curtis, the juror whose words Van Leer-Greenberg had quoted from a press conference that immediately followed Ortega’s April 18 conviction. Curtis was one of six jurors who attended the sentencing, including Sandra Nazario, Edgardo Chacon, and Darnell Jones. Chloe Beck, an alternate I spoke to after the trial ended and she was dismissed, was also in attendance. 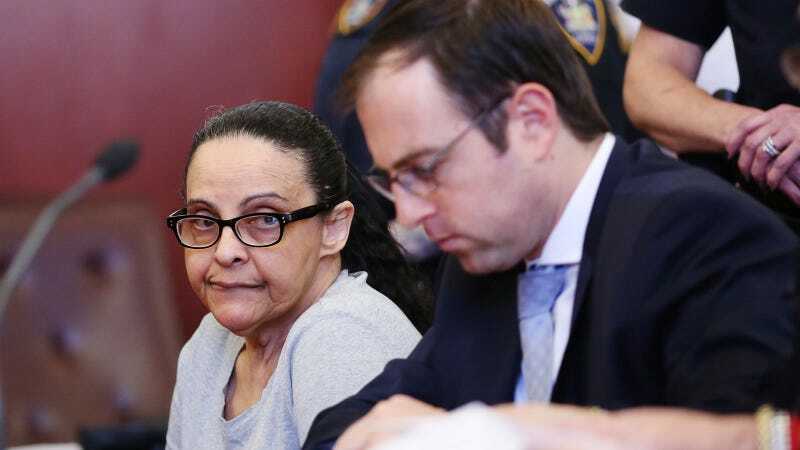 Almost a month after the trial concluded, many of them talked about its residual effects: flashbacks to moments from the trial upon seeing nannies on the subways or going to bodegas and seeing snacks the Krim children ate. “I’m still dreaming of those kids,” said Chacon. The jurors I talked to told me they attended the sentencing to see this case to the end, perhaps for a sense of closure. But those who followed it surely know that even if Monday concluded the case of Yoselyn Ortega (for now, pending an appeal), the sentence did not represent pure closure, per se. It was merely the gesture of it.